What is the da Vinci surgical system and how does it work? Developed under contract of the United States Army, robotically assisted surgery made its way into civilian hospitals in the United States when it was approved by the Food and Drug Administration (FDA) in 2000. The first prototype of the da Vinci surgical system was created in the late 1980s at the former Stanford Research Institute (now SRI International). Intended for the battlefield, the system would have allowed military surgeons to operate remotely on wounded soldiers, but its commercial opportunity was evident to a man named Dr. Frederic Moll. In 1995, Dr. Moll co-founded a new company, Intuitive Surgical Inc., with business partners John Freund and Rob Younge and purchased the rights to the surgical system. In 1997, the first prototype was ready to be tested, and by 2000, the company received clearance from the FDA to use the robotic device in general laparoscopic surgeries, such as gallbladder removal. The FDA subsequently expanded the device’s use to include cardiac, thoracic, urologic, gynecologic, pediatric, and head and neck surgeries. Since its approval, the da Vinci surgical system has been used in numerous surgeries around the world. 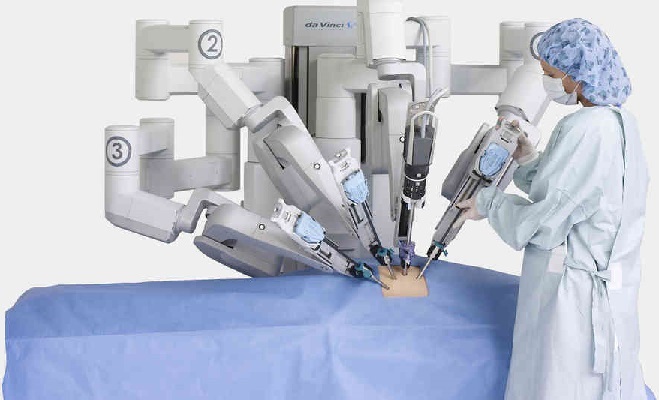 The da Vinci surgical system uses robotic technology to assist surgeons in complex and delicate operations, which are performed with only a few small incisions in the patient. The robotic system is intended to perform surgeries more precisely than a human can. The system’s mechanical arms can bend and rotate to a greater extent than the human hand, and the surgeon can view the operation on a magnified, high-def screen. The surgeon controls the mechanical arms of the system, which perform the surgical operations on the patient, while watching 3D HD screen. Whatever the surgeon does using the master controls, the mechanical arms do inside the patient, but on a smaller, more precise scale. A console where the surgeon sits during surgery, operates the master controls and watches the screen. A patient-side cart with three to four mechanical arms that hold surgical instruments and a camera. The surgical instruments include scalpels, forceps, graspers, dissectors, cautery, scissors, and more. As with all technology, the da Vinci surgical system runs the risk of failure during operations. Numerous reports of one or more of the mechanical arms malfunctioning in the middle of surgery have been submitted to the FDA. In fact, the FDA has received a number of device failure reports that include breakage of different components, mechanical problems and image or display issues. On its website, Intuitive Surgical warns there is a risk of surgeons having to switch from robotically assisted surgery to more traditional surgical techniques in the middle of the operation due to complications. This can prolong surgery and the time a patient spends under anesthesia which increases the risk of complications, states the company. These complications can cause long-lasting dysfunction or pain and may require longer or unexpected hospitalization, according to the company website. These complications may also require reoperation to fix the problem. Many complications, it seems, arise from accidental nicks and tears to tissue or organs inside the body from the surgical instruments. Because the da Vinci system is controlled by the surgeon, barring any mechanical or device failure issues, the outcome of the surgery relies almost solely on the capability of the surgeon. All of the surgeons who responded to the survey said they needed to perform multiple surgeries before they felt fully comfortable using the da Vinci system. The FDA received a growing number of complaints from patients after complications arose from surgery with the da Vinci surgical system. Some of those reports were sent in by family members whose loved ones died as a result of surgical complications. One man reported that his father died after the surgeon nicked something during a colorectal surgery. His father underwent two subsequent emergency surgeries before succumbing to his injuries. In another report, a woman said her bladder was damaged during a hysterectomy because a needle fell off the mechanical arm and went missing inside her body. Another man was reportedly injured after a prostatectomy (prostate removal surgery) when the surgeon tore his intestines and bowels with the da Vinci surgical instruments. The man was reportedly hospitalized for 45 days following the surgery and suffered from fevers, confusion, abdominal distention, sepsis, abscesses and giant fistulas. Lawsuits against the makers of the da Vinci surgical systems claim that safer alternatives were available and that design defects in the da Vinci system may have been responsible for serious and possibly life-threatening injuries. If you or a loved one were harmed during a surgery using the da Vinci surgical system, please do not hesitate to act. Call the Hood National Law Group today at 1-800-214-1010 or use the form on the right-hand side of your screen.